“This is basically what we’re doing …” // It never fails: take a group of leaders to a church 10x larger than any of their own churches and someone will “write off” the experience because they don’t see anything different between what they do and what the visited church does. They see and highlight the surface similarities and assume that everything else is the same. What a missed opportunity! Rather than doing the hard work of looking beyond the surface and attempting to find points of similarity and departure that could inform their ministry, these leader check their brains at the door. They miss the opportunity to innovate. This leads to decline as people (leaders included) dismiss the church’s outreach. By definition, if you are learning from another church, you have much to learn! Lean in and find those points of departure. “This can never happen at our church …” // The opposite end of the spectrum is being paralyzed by what you see and thinking that God couldn’t do anything on this scale at your church. Every team member you meet seems superhuman … every program you encounter is teeming with energy and purpose. 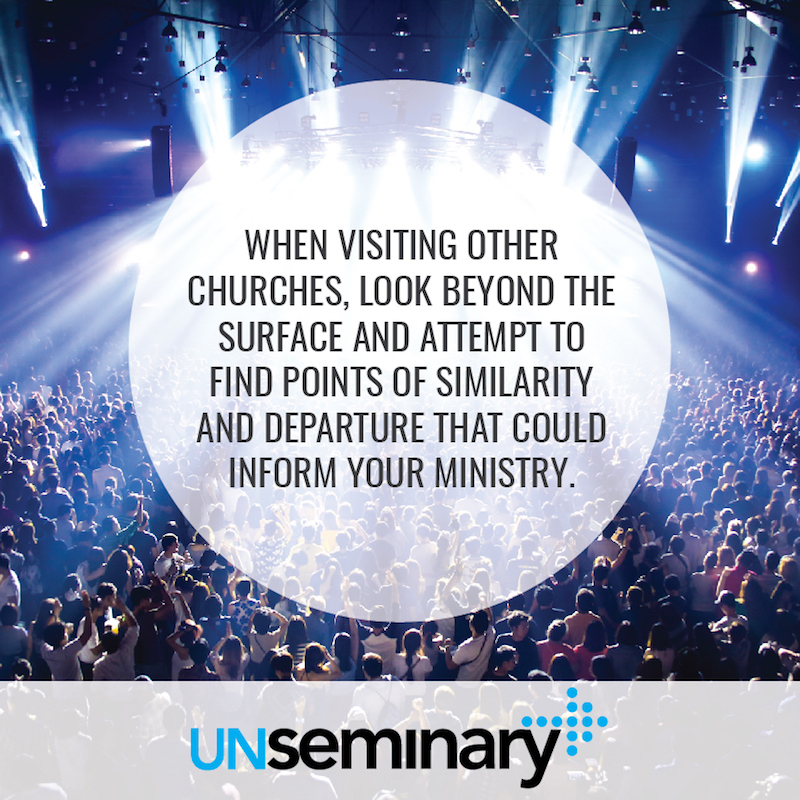 This is a particular problem when you visit churches that are significantly larger than your own church, because the scale of ministry is hard to get your head around. In those moments, I always remember what my dad used to say, “Remember: they put their pants on one leg at a time too.” The amazing and inspiring thing about visiting a church is that God is using normal people like you and me to impact the world. He’s doing it there and can do it with you. Stay encouraged because God wants to do something great in your ministry. 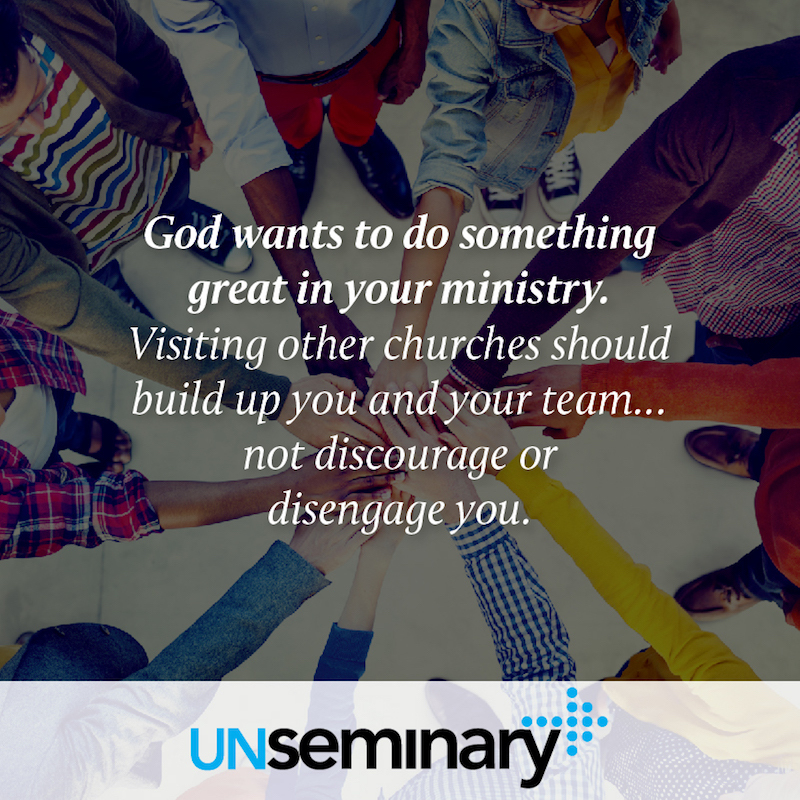 Visiting other churches should build up you and your team … not discourage or disengage you. Identify Your Temptations // Call out these two extreme reactions that could happen within you and your team. This will help you fight the urge to dismiss what you see. It also frames the experience and helps people maximize it. Do Your Research // Before you land at the church, make sure you know what you are going to study. Often, there are literally hundreds of things that you could learn from other churches. Narrowing the field helps you focus and fight feelings of being overwhelmed. Talk to Normal People // Don’t bother even attempting to talk with the “senior pastor” of the church. Engage with the staff and volunteers who are doing the ministry. You’ll be encouraged by how normal people are and by the level of commitment they have to the mission. Brief, Lead, Debrief // If you are taking a team to visit another church, make sure you brief them ahead of time on what you want them to learn about. Lead your people through the experience and point out what you are learning. Finally, as the experience comes to an end, have the entire group reflect on what they learned. Shared learning can drive the lessons deep and chase away discouragement. Slow Down // Don’t rush these experiences. See as much as you can possibly see. If they have 3 or 4 campuses, attempt to see as many as you can. Stay for Monday and see if you can get in on some of their weekly meetings. Often, a cursory view of another church doesn’t give you an accurate look at what is really happening with it. Getting more information will help you get a clearer picture.